Wolfgang Neu was born on 11 September 1909. Following completion of his flying training at Jagdfliegerschule 5 Leutnant Neu joined JG 26 on 11 June 1942. He was assigned to 3./JG 26. On 23 August, while returning from a mission, Neu overturned his Fw 190 A-2 (WNr 2126) on landing at Wizernes injuring himself. He was shot down in Fw 190A-4 (WNr 5642) by RAF Spitfires near Marquise on 9 January 1943. He baled out wounded. Oberleutnant Neu accompanied I./JG 26 to Russia in early February 1943. He claimed his first victory on 27 May 1943 when he shot down a Russian LaGG-3. When I./JG 26 relocated back to the Channel front in early June, Neu had raised his victory total to two.On 15 June 1943, Neu was named interim Staffelkapitän of 3,.JG 26 to replace Hauptmann Rolf Hermichen (64 victories, RK-EL) who was appointed interim Gruppenkommandeur of III./JG26. On 4 July, Neu was transferred away to undertak a tour as an instructor. 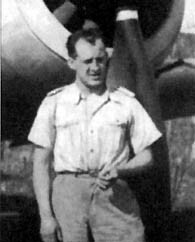 Neu returned to JG 26 from his period of instructing in September 1943. He was assigned to 8./JG 26. On 24 October the Staffelkapitän of 4./JG 26, Hauptmann Kurt Ebersberger (30 victories, DK-G) was killed in aerial combat and Neu was named his succesor. Neu was, at 35 years of age, the oldest pilot in JG 26. Neu recorded his 10th victory, a USAAF P-47 near Aachen, on 24 February 1944. He claimed his 12th and last victory, a RAF Spitfire over Brussels on 19 April. On 22 April 1944 Hauptmann Neu was killed in combat with American fighters. His damaged Fw 190A-6 (WNr 530755) “Blue 16” crashed near Katenborn-Eifel. Wolfgang Neu recorded twelve victories, including seven four-engined bombers, in 111 combat sorties.